The Soller Railway runs through the streets of Palma for a couple of km before reaching its own right of way on the outskirts of town. 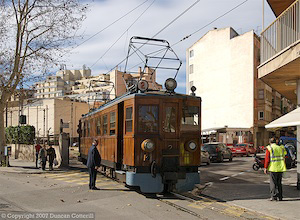 No.4 was photographed picking its way between the buildings with the 10:50 to Soller on 7 February 2007. 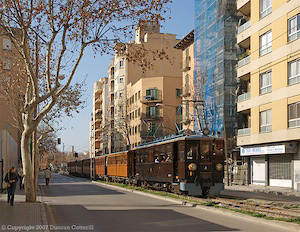 No.2 was only a few yards from the Palma terminus when it was captured passing the bus station with the 11:55 from Soller on 10 February 2007. Railway staff kept a watchful eye open as No.2 edged out into the road as it ran round its train at the Soller Railway's Palma terminus on 10 February 2007. 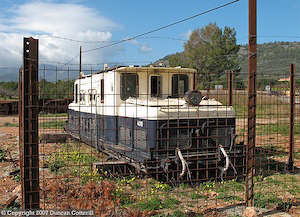 Former EuskoTren electric No 4.010 sat forlornly in a cage next to the Soller Railway's Santa Maria station. Is it too much to hope that this old beast might run again? How many railways in the world, let alone in Europe, still use traction built in the 1920's in everyday service? There can't be many but the Soller Railway on the Mediterranean island of Mallorca is certainly one. Trains continue to be operated by 1929 vintage, wooden bodied power cars hauling strings of even older trailers. The four 3-foot gauge, 1200V DC power cars were built by Carde & Escoriaza of Zaragoza with Siemens electrical equipment and have changed remarkably little over the intervening 78 years. The opportunity to photograph them arose during a short family visit to Mallorca in February 2007. When I visited the line on 7 Feb, No. 4 worked the 09:10 and 11:55 Soller - Palma and the 10:50 and 13:05 in the opposite direction. On 10 Feb, No. 4 worked the 09:10 and 10:50 but No.2, which had worked an ECS north from Palma at 10:30, worked the 11:55 and 14:10 from Soller and the 13:05 from Palma. Trains comprised up to 6 coaches and some workings were very well loaded. An electric loco body numbered 4.010 has been left in a steel mesh cage beside the line close to Santa Maria station. It is painted in a blue and cream livery and has suffered some vandalism, e.g. broken windows. The loco appears to be a former EuskoTren class 4000 and carries the name "IRUKURUTZETA". A pair of bogies, possibly from the same loco are in a siding at Bunyola (but they should be metre, not 3 foot gauge). Photographically, the Soller Railway is difficult. For much of it's length it runs through industrial estates and then flat farmland, planted thickly with olive trees. Around Bunyola, where the scenery starts to get hilly, the lineside is badly overgrown. That situation continues beyond the tunnel under the Sierra Tramuntana on the spectacular descent to Soller. Most of this section also appeared to be permanently in shadow at this time of year. The best shots were in Palma itself where the line runs through the streets for the last couple of km to its terminus. Obviously traffic can be a problem here but by careful choice of location, it's possible to get some interesting pictures. It would appear that the city authorities are keen to get rid of the street running but hopefully it won't happen any time soon. 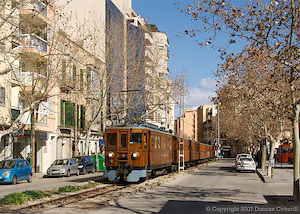 As well as the Soller Railway, there is another railway on the island connecting Palma with Inca, Sa Pobla and Manacor. The SFM metre gauge system is operated by modern DMUs and wasn't explored. A new double track electrified line is under construction north of Palma. This is thought to be a branch from the Inca line to the university campus. It emerges from a hole in the ground just south-east of the Soller Railway's Son Sardina station, parallels the Soller line northwards for a km or so then climbs up and crosses over the line and the main road on a bridge before disappearing to the north-west of Son Sardina village. Mallorca might not be the epicentre of the gricing world but if you happen to be there, the Ferrocarril de Soller is well worth a visit. The line's management clearly recognise its uniqueness and historical value but the local authorities seem to want modern and efficient at all costs, i.e. plastic and soulless. How long the Soller line will be able to resist progress is unclear. See it while you can.